Find hotel near Curia Arcivescovile Dell' .. This small and elegant catholic church is easy to miss when you are wandering on the streets. It is right in the middle of the many houses. Not many people know about it. 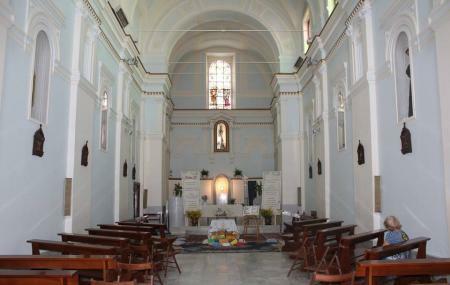 But, do visit this church to experience the peace and warmth of the place. It is easily accessible. Try the best Campobasso trip planner to visit this Curia Arcivescovile Dell'arcidiocesi Campobasso Bojano as well as many others. Fine Accommodation options like Le Cupolette, Hotel Villa D'evoli and Hotel La Tavernetta will meet your requirement of where to stay in Campobasso. Chalk out the best way to discover the city with Campobasso vacation packages. Check out various modes for how to reach Campobasso. Love this? Explore the entire list of places to visit in Campobasso before you plan your trip. Fancy a good night's sleep after a tiring day? Check out where to stay in Campobasso and book an accommodation of your choice. How popular is Curia Arcivescovile Dell'arcidiocesi Campobasso Bojano? People normally club together Museo Internazionale Del Presepio In Miniatura "guido Colitti" and Terra Degli Unicorni while planning their visit to Curia Arcivescovile Dell'arcidiocesi Campobasso Bojano.